Social Media Management tool HootSuite today face technical issue and expose email address's of thousands of users. 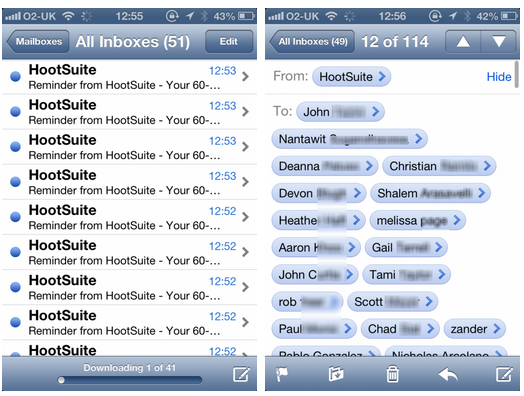 Due of error lots of people receive email reminders with warning that their free 60-day HootSuite Pro trial was about to end, but also included the names and email addresses of other people using the service. According to Hootsuite, the incident occurred to under 4000 emails and many of the users who are getting the email spam were not even signed up for HootSuite’s Pro trial. In a blog post HootSuite said, "At this time, we are requesting that recipients destroy the messages in order to help us contain the issue. Privacy is a paramount concern for HootSuite and this is in no way a reflection of the respect we have for our users and their privacy." "Given HootSuite’s recent acquisition of Seesmic, we could speculate that the mass of emails could be down to a failed import of user accounts. We have, of course, reached out to HootSuite for comment on what exactly has happened and asked why users are seeing their names and email addresses included in messages sent to other users." Thenextweb said.